A few weeks ago, together with the Presto team at Facebook, we announced the first-ever Presto Summit. 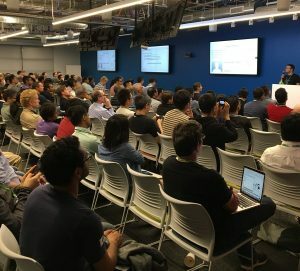 In less than 2 weeks the event was sold out as the number of sign-ups exceeded the venue capacity at Facebook’s HQ. We will certainly be ready for a much bigger event next time! The all-day Presto Summit brought together many Presto users, committers, and other big data analytics fans. Participants from over 40 companies joined us on July 16th. The agenda was filled with high quality talks from some of the leading members of the Presto community. We are ready to share all slides at this point. The recordings will also be available at a later date. In addition to featuring this exciting content Presto Summit also created an excellent opportunity to network with other Presto enthusiasts. It turned out that many community members are taking on similar challenges and can learn a lot from each other. On behalf of all the organizers I would like to thank all the speakers and attendees for helping us to create such an amazing community event. We are looking forward to organizing another Presto Summit early next year. Stay tuned!